I use to blog on wordpress, so since I've decided to starting blogging again on my new website, I will be pulling some of my favorite old blogs over here. Not much has changed other than a few plants in the design and I still love it! I shoot in here often for The Vaunt Project. I live in an old warehouse loft downtown Nashville, TN. I have lived here for close to 12 years now. Over those 12 years I have decorated, redecorated, designed and redesigned and painted literally every wall in all 1600 square feet of this entire space, and most of them more than once. I rent. Yes, I could own a house by now, but I love the space, the location, my neighbors and my landlords and well, it has just worked out this way so it is what it is. Because I rent I try to design my spaces on a budget. I definitely utilize the "free and magical pile" which is the area in my building where my neighbors and I trade and discard furniture, art, and decor. I also love thrift stores, Habitat For Humanity Restore with home building materials, supplies and paint, and any junkyards that I can into for free. While working on a budget can be slightly limiting, and there are certain things that you just don't invest money in when you rent. Sure, a gallon of paint and some curtains are ok, but you don't invest your money in drywall and finishing your ceilings so the black plastic that covers the insulation in your rafters doesn't show. So as you read on and see the pictures of my redesigned bedroom, please keep in mind that I rent and my building is over 100 years old, so some things I just have to deal with. And yea, one day we will buy a house, but until then...more wall paint it is. The space is small enough as it is, then throwing in these random colors and ugly ceilings, and mismatch decor and furniture, ugh, I had finally had enough. Time for change. For starters I went to good ol' Habitat and found 2 gallons of bright white paint for $20. *score* Gallons are $10 and quarts are just a $1 most of the time. WIN! Instant room expansion...primarily white walls and white washed floors. The brick was already a dingy white, I just slapped a few stripes of white on it and called it a day. You see to the left of the image I added some 8' x 4' cheap wood paneling. This is because that wall, for starters, had one million holes in it and the dry wall was never finished so all the seams were exposed. A cheap way to save me some time and add a makeshift accent wall. I also had plans for the top of my walls, specifically for a wall that the insulation was exposed. Below is scrap wood that I got for free. I've seen this stuff used before, but in true Lindsey fashion, I didn't really read about how to do it. I collected some scrap wood, got out my saw and some wood stain and decided to wing it. I gathered up all of the old scrap wood I could get my hands on. Pallet wood from the junkyard, wood from the old barn at Jamie's studio, and my maintenance guy (a good friend) threw me some scrap wood from around our property when he caught wind of what I was up to. He knows me and my "projects" well. Like putting a puzzle together I stood atop my 6 ft ladder and pieced it together. Again, not perfect, because I live in an un-perfect place, what works for me may not work for everyone else. *The hubs helped me paint, so we may have missed that spot on the pillar with white...I fixed it eventually. I covered the upper 3 ft of the upper part of two walls in my bedroom as best as I could without getting my saw out again and overthinking it. I tend to rush through this kind of stuff because I just want to get to the decorating part. I applied "weathered oak" stain from Home Depot to my cheap $10 ply boards for a slightly more weathered look to match my scrap wood boards. I added some trim to frame out the "accent wall". None of it matches...this is just how I do it for cheap and with an "eclectic" look. Obviously professionals wouldn't use this approach, but when you are on a budget and have no one to disappoint this works. After this, I could start the fun stuff! Furniture and decor! Onward and upwards, I had ten days to complete my bedroom makeover into our greenhouse inspired sleeping chambers before my future hubs would return home from the road. Things I planned to use. Free rusty junk from a junkyard, the giant armoire on wheels *score* $75 on Offer Up (talked him down from $175), this tacky gold mirror reminded me of a tree $10 (I painted it to look like wood) Offer Up, the pillars would become plant holders 4 for $10 on the Let Go app, a bunch of clay terra cotta pots from Offer Up $20 and the tall green cabinet $10 from same place as the pillars, it was there when I arrived...clearly meant to be mine as well. Because we lack in square footage in our bedroom I wanted to play up the high ceilings and bring the eye upwards in hopes to make the room feel bigger. I started by adding the tall armoire and hanging a shelf. I added plants as I went. I will be doing another blog on just my plants soon, but the majority of my plants I just propagated so I could have many small pots rather than just a few big ones. The vine plant you see here is Pothos, super easy to grow and propagate. It does well even in very low light, and can stand some pretty serious neglect. To propagate you can just clip the vine below a leaf, pull some lower leaves off and stick the vine in water and it will stay perky and green and eventually root. You can leave it in water or throw it in some soil. This is definitely a beginner's house plant. We also have some "built in" shelves around our door way, I added a tall Cactus print from the Habitat Home Store that I have had for two years with no real home until now and more plants, again to bring the eye up when inside the room. I built a small shelf above our makeshift headboard too. I added more plant babes and some little frames that I picked up at Goodwill for a couple of bucks or had around the house, stained them to make them cool and made my own quotes and artwork to go inside for a little more decor. Truth: No pants are actually the best pants. Next I added more decor and plants to my design. I always design as I go. There is a lot of standing back, staring and wandering around my house before I make a decision on what pieces to add where. I'm borderline a hoarder, an organized hoarder at least, specifically for designing and creating without needing to leave my house much to do so, this plays into my set design for shoots also. I can start most projects on a whim with what I have in our/Lindsey's closet/project collection/spare bedroom. I used old picture frames to frame my plants and little pot brackets (Amazon.com) to hold my plants to the wall. I added a print (a fan of my fiancé's band had just sent him) to the back of an old window that I found and used it as a frame. I threw in some more plants and some horse bones (I collected these bones from my parents woods years ago and knew eventually I would use more of them), a few thrift store mirrors I have moved around my place for years and it is almost complete. I have one blank spot that I am still searching for the perfect piece to fit into. I have a feeling it will take one more trip to the junk yard for a rusty, visually pleasing piece to tie it all together. I wanted our bedroom to be relaxing. I sold our television at the beginning of this project because I want to read more instead of searching Netflix for a boring documentary narrated by some guy with a monotone British accent just to fall asleep to. Selling the TV almost completely funded my bedroom makeover. I brought in a bookshelf we had elsewhere in our loft and my new green cabinet for books and all of the 175,835 hats Kelby owns. I rounded up all the books that we have accumulated over the years...yet I haven't read but maybe 5 of them. I donated the books I knew I would never read...i.e. Fifty Shades of Grey (compliments of my sister) Zombie books (compliments of my old roommate) and Zorro...yea Zorro...where did that come from? Yes, Molly, the supervising schnauzer is in this pic too...luckily she naps a lot. I created what I consider a piece of art out of another rusty old something-or-other from the junk yard, more bones and some new air plants for this wall piece. I added a horse tooth to keep the lone air plant company inside this little glass terrarium-esq globe, hanging it from some old wire from the back of one of those old picture frames I used elsewhere. I think its awesome, maybe not everyone's cup of tea, but it fits my style and my love for nature and the forgotten. One of my final steps was adding my green curtains. I wanted minimal color other than pops of green from my plants, a few very tiny pops of bright color from art work, and spots of bright orange in the rust on my old pieces of decor. However, it's unlike me to not want a bold statement piece. I thought semi-bold colored curtains to frame our giant warehouse window might just work. My curtains were the most expensive thing I purchased and the only "new" items in my design. These curtains are in a shade of green called, jade. Ok...confession time...these curtains were no easy task to hang, and yea they are hanging from a rusty old pipe I found in our alley, attached to a 2x4 that I had to drill into my rafters. The height of my "curtain rod" could be slightly lower, but again, working alone is hard, making things level standing over 6 ft in the air on a ladder with really heavy materials, near your 3rd story window, squashed between the wall and your bed, securing electrical conduit brackets as rod holders and a heavy pipe as your curtain rod...well let's just say I felt like I deserved a metal after getting these gorgeous drapes hung in such a crazy way. I added a shelf out of a closet on my side of the bed with my essential oil diffuser, and the necessities like a reading lamp, plugs for my phone and computer, another plant, and some pens and pencils to document those "profound thought" moments I have at 3am. On the future hub's side of the bed I added a vintage radio that was gifted to me, a lamp, his other stuff....(guns and knives...yea I just don't look at them and they leave me alone) and basically a tree...oh and that cool wall art piece I made. My greenhouse inspired bedroom is now complete-ish. Design is what you want it to be and the greatest thing about it is that you can change it as much as you want, there are no rules. I love changing my decor, it brings a freshness to something that can become stagnant. When you have lived somewhere as long as I have you have to change it up! I inherited the need to change my decor from my mother for sure. As kids we would come home from school to a different space every few months or so, I loved it. I wish so much that my mother was still here to share in my constant design and decor creations with. I never got to meet Kelby's mother either, we both lost our mother's when we were in our early twenties, but to hear him put it, she was the same way, she loved decor and "themed-designed" spaces. Luckily for me the frequent change of our spaces doesn't come as a shock to him and brings a sense of his mother into our home as well. *heart string tug*. To conclude my long winded, heavily illustrated blog post, I'm sharing this because I wanted to inspire people to think outside of the box with decor, to share my trash to treasure vision, how old is still new if you let it be, to encourage people to upcycle and repurpose things to reduce pollution, to push people to make their own spaces unique to their own personalities and to not be scared to take a risk with design and decor and to show you that you can decorate on a budget. I absolutely love our new bedroom space. I feel like I'm in a little greenhouse with our big comfy bed in it. I live downtown, smack dab in a loud city, not much nature happening around here. Hopefully one day we will live in the country and I will be surrounded by nature, but until then I'm harboring nature indoors to sleep with me at night. Perfection in home design and decor only exists on HGTV and for people with lots of money in my opinion, so if you can get past the idea that everything has to be PERFECTand appreciate the small things that are perfect or close to it, you can have a space that you love and want to spend time in. There is a sense of calm and accomplishment that comes with every space I design. I'm addicted to both of those feelings. I'm sure I will never stop. Here are some before and after bedroom shots. 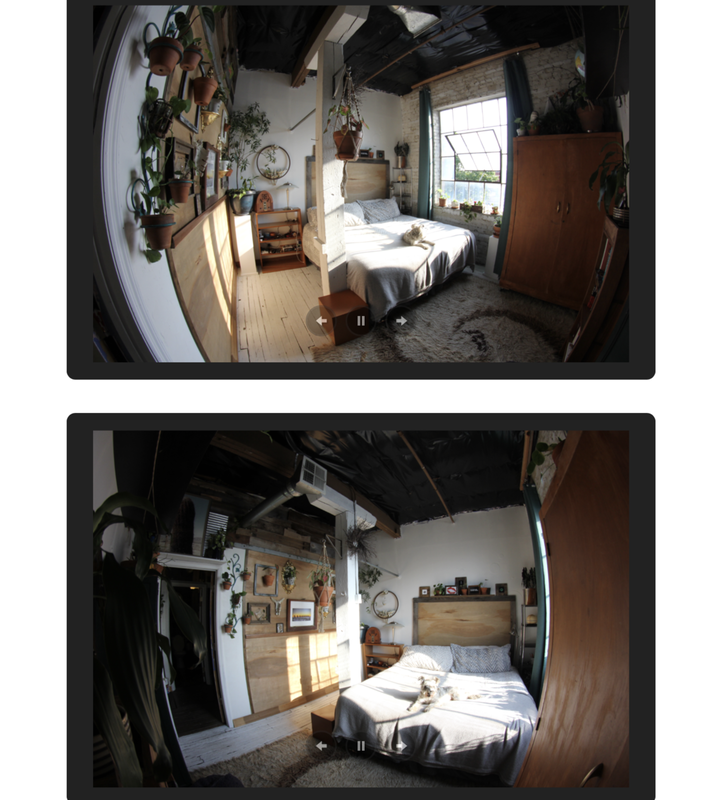 *stop judging how bad the before is, the rest of my loft is cool* Haahahahaa. Older PostThe Hair & Makeup Pro Behind Glam Co.